DAVID E. BOATMAN M21 (USA):Designed for use by undercover police officers, the M21 is an interesting weapon. The most noteworthy feature is the M21's ability to fold into a inconspicuous rectangular block. When closed, the M21 can be made to resemble a number of different everyday objects. For example, it can pass as a video camera when an optical sight is attached, a portable radio when an antenna is snapped on, or a tool box when a carrying handle is fitted. Helping to reinforce the illusion is the weapon's exterior finish. It is a teflon based sealant that is available in a rainbow of colors. Those produced so far have been made in black, red, dark blue, light blue, tan, yellow, green, and brown. This exterior finish also has an additional, less obvious benefit - being teflon it negates the need for conventional gun oil, thus preventing any "gun" smell. 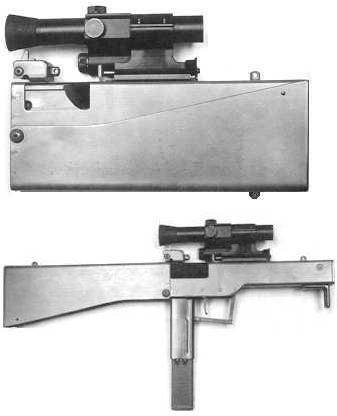 <P>	The M21 functions based on the well-tested blowback method of operation and uses a number of parts from the Uzi, including the magazine. The M21 can be fired fully automatic only and there is no provision for semi-automatic fire. The cyclic rate of fire can be adjusted by adding or removing rubber washers behind the bolt. The minimum is 690 rounds per minute while the maximum is 895. There is also no safety, aside from the inability to fire the weapon when it is folded. There are no iron sights, but as mentioned above, an optical sight can be easily attached. One final point worth mentioning is the charging handle. It is found underneath the muzzle and is pulled rearward to chamber a round. Its location also allows it to serve as a handstop, preventing the firer's hand from slipping in front of the barrel during firing.